We all know that Easter is about a two very important things - Mini Eggs and Creme Eggs! And these brownies combine them both so you don't need to choose your favourite. They use my go to brownie recipe with a load more chocolate thrown in for good measure. Doesn't that sound like a recipe for happiness? I've made them for the last few Easter hols, last year for guests and this year for my WI meeting and I thought it was about time that I shared them with you. Because they are super easy to make and seasonal AF! Preheat the oven to 170°C and line your baking pan with parchment paper so that it over hangs the pan. In a microwavable bowl, combine the butter, sugar, cocoa, and salt and pop it in the microwave. Cook the mixture until the butter is melted and with a few stirs the ingredients are fully combined. Add in the eggs one by one. Stir each of them until they are fully combined. The batter should look really shiny. Stir in the flour until you cant see it any more. Add in the bag on mini eggs and stir. Stir until the mini eggs are well combined. Pour the mixture into the baking dish so that it's evenly distributed. Chop the mini creme eggs in half (do it along the seam as the split easily) and pop them on the top of the brownie batter - egg side up. I try and space them out to create pieces. Bake in the centre of the oven for 20-25 minutes until a pick comes out clean from the middle of them. 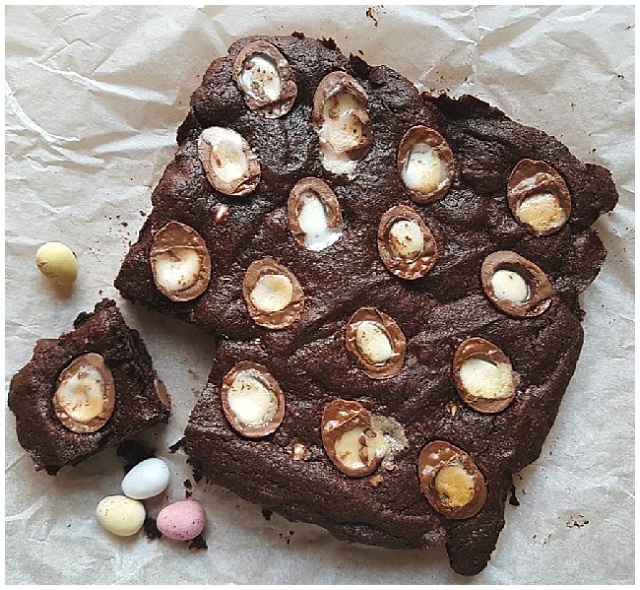 Leave to cool completely and then cut into squares around the creme eggs. Or just eat from the pan, with a spoon. Either or. Both are valid decisions! What is your go to Easter treat? Hit me up with links to your faves in the comments please! Hopcity Leeds - Hype beers and beards!